In the land of sunshine, there are rays of knowledge waiting to be soaked up by journalism students and advisers when thousands of them descend on Anaheim, Calif., for the 2008 JEA/NSPA spring convention. Disneyland (and the Disney California Adventure park built next door in 2001) is only the most well-known of Anaheim’s attractions. Shopping and restaurant options abound, with Downtown Disney, The Block at Orange and the Anaheim Garden Walk providing no less than three modern, open-air retail/entertainment centers. Dozens of beaches reside within 30 miles of Anaheim. Los Angeles (Hollywood, Universal Studios) is immediately to the north and San Diego (Sea World, San Diego Zoo) is a short drive south from the city. And all under one roof, in April at the Anaheim Marriott, you’ll find the most student journalism expertise available anywhere in one place. 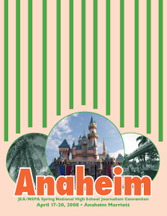 Get your ticket to learning and pass through the turnstiles for the OC (Outstanding Convention) of Anaheim.